The influence of England on Western Civilization has been much larger than its relatively small size. Its language has become dominant in commerce and politics throughout the world and its political system has been a model for many other countries. 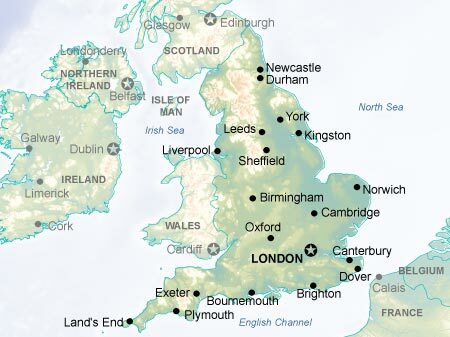 England is the largest and most populous country occupying the island of Great Britain. It was once part of the Roman Empire, having been conquered by Julius Caesar. The tribes from which most modern English are descended, the Angles, Saxons, and Jutes, began arriving around 449. During the Struggle for Supremacy (613 to 829), the kingdom of Wessex eventually dominated its rivals Northumbria and Mercia. This was followed by a long period of conflict with the Danes. The Danes had finally been defeated when William the Conqueror arrived from France and installed the Norman Dynasty. England in the Middle Ages was a fairly minor factor in European history, but it developed naval power and became the first country to experience the Industrial Revolution. At the peak of its influence before World War I, the British Empire was the most powerful force in the world. England's largest city is London, the capital, through which the Thames flows. England is the largest of the countries making up the United Kingdom.